Richard is 7 years old in the 1871 Census of Gwinear. He is living with his grandmother and mother, who is listed as "deaf and dumb from fever." Researched 12 July 1983: I have a copy of the ship record when Richard returned to the U.S. after his wife Mary died. Intended destination: Ishpeming, joining bro-in-law, J.Rowe and mother and father-in-law. 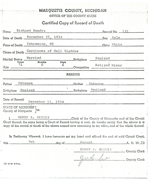 [S161] Death Certificate, Richard Hendra.